The first important thing to mention is, that there are two types of the Azure billing API. One is the billing API for EA (enterprise agreement) customers. This API is easier to use, because it returns the costs in a separate field (extendedCosts). If you have an enterprise agreement, I recommend to check the following blog post: http://www.redbaronofazure.com/?p=631. 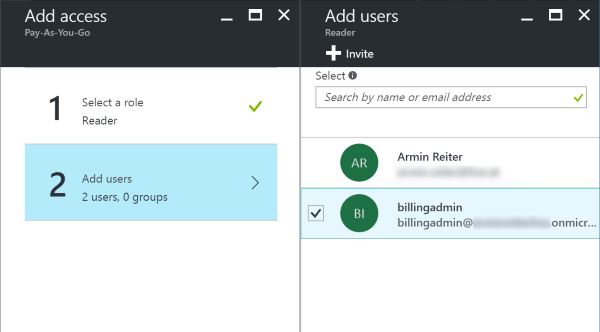 The other one is the billing API for non EA users (see Azure Billing REST API Reference. This API has two services, the RateCard API which returns costs for your resources (e.g. S1 DocumentDB costs per hour in region West Europe). 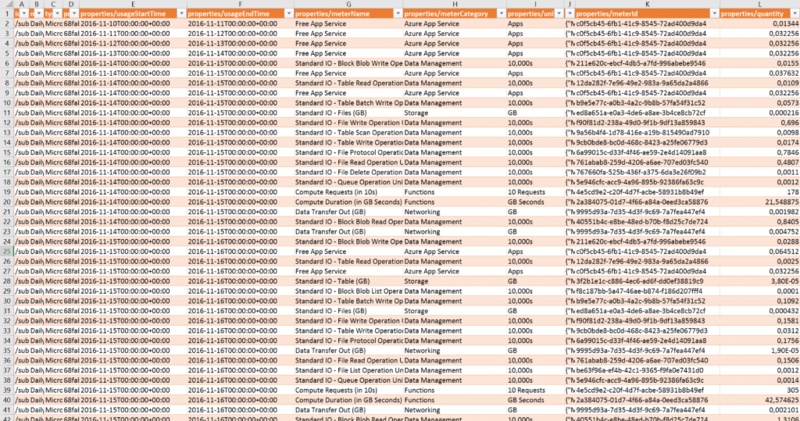 I already blogged about how to export the RateCard data to CSV. In this post, I’ll focus on the second one which returns the usage data. This service returns the usage of your resources – e.g. “Standard IO – File Write Operation Units (in 10,000s), quantity: 3.182, …”. Unfortunately, the usage API does not return the costs per resource. If you want to know the costs, then you need to combine the RateCard data with the Usage data. 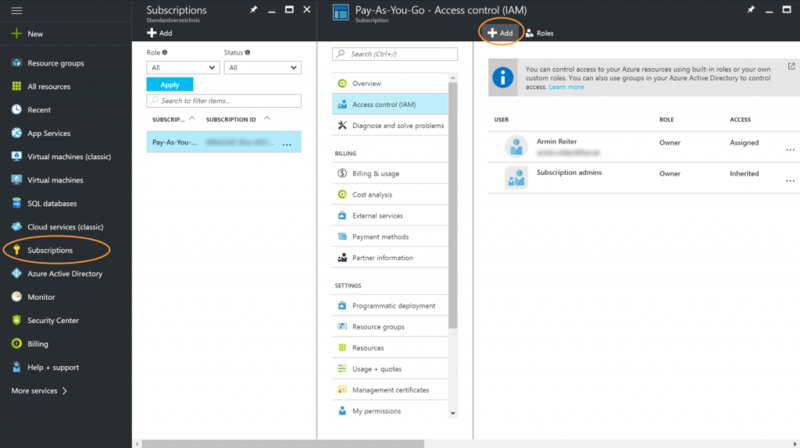 This blog post is still valid, it shows the how to configure and build an application that uses the Azure Billing Usage REST API. Please download or clone the solution from GitHub: https://github.com/codehollow/AzureBillingUsageSample. The other values will be configured in the next step. So leave the file open so that you can copy and paste the values from the AAD configuration. 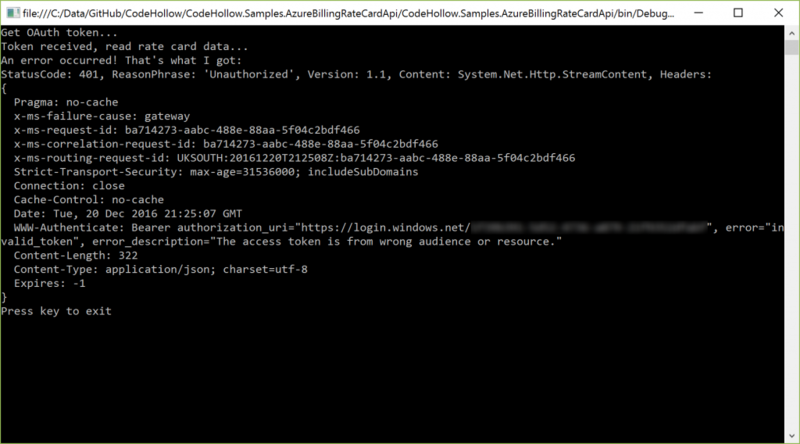 ATTENTION: The following steps are the same as in my previous post about using the Azure Billing RateCard API. Before we can run the sample application, we have to add the application to Azure AD and give it the right permissions. Copy the Redirect URI and paste it to the app.config to “RedirectUrl”. When the app is created, open the app (in App registrations), go to Settings and “Required permissions”. 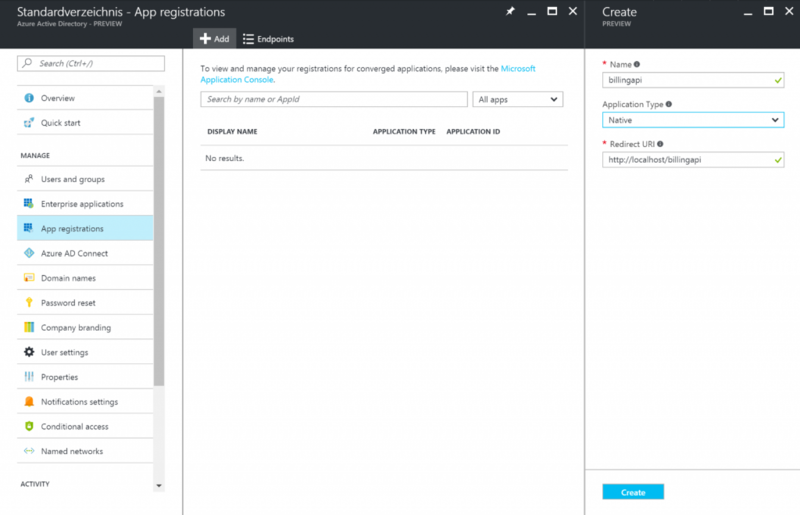 Press the add button and add: Windows Azure Service Management API. 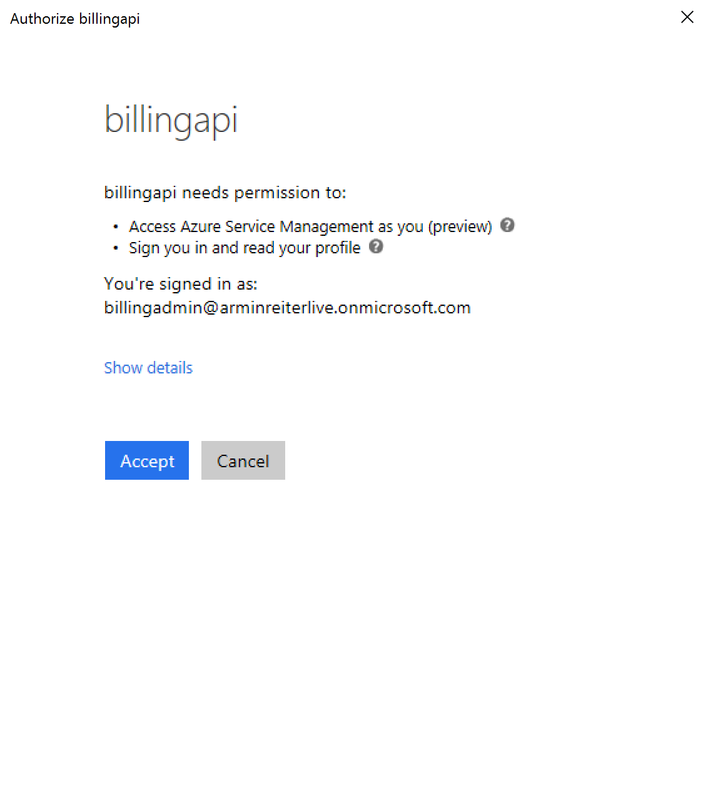 The client Id is called “Application ID” in the Azure portal. You can find it when you select the app in the “App registrations”. Copy it and paste it to the app.config to “ClientId”. Depending on what you want to use, you have to give the user or the application “Reader”, “Contributor” or “Owner” access to the subscription. Navigate to your subscription, select your application and go to “Access control (IAM)”. Press save and copy the key! This is the client secret that needs to be pasted into the app.config – “ClientSecret”. There are many reasons why this could happen. Look at the output of the webrequest and check the error_description field. I once got the following message: “The access token is from wrong audience or resource.“. And…believe or not…the slash / at the end does matter! So if you are using: https://management.azure.com (without / at the end), then you will receive this error! AADSTS65005: The client application has requested access to resource ‘https://management.azure.com/’. This request has failed because the client has not specified this resource in its requiredResourceAccess list. This error occurs if the application does not have enough permissions. I solved it by doing Step 3: add permissions to the service management api. If you have another application, then you probably need to add other/additional permissions. 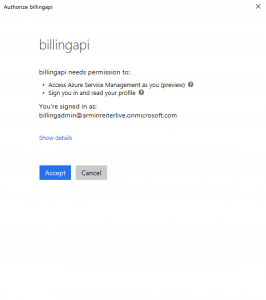 For the Usage Billing API it’s enough to configure access to the Service Management API. AADSTS70002: The request body must contain the following parameter: ‘client_secret or client_assertion’. Step 2: add new application to active directory). If you use application authentication (client id + client secret), this error will not occur because the authentication process does not call the reply url.